Andrew Austen Luck was born on 12 September 1989, in Washington D.C., USA. He is a professional football quarterback, best known for playing with the National Football League’s (NFL) Indianapolis Colts. He has received praise and recognition for his performances ever since joining the NFL and is considered as one of the greatest quarterbacks to enter the game in recent history. His success playing football has put his net worth to where it is today. How rich is Andrew Luck? As of early-2016, sources estimate that his net worth is at $20 million, mostly acquired through a successful football career, particularly from his current contract with the Indianapolis Colts, reportedly earning him around $4 million per year. Aside from football, it is known that Luck also had great educational achievements. Andrew is the son of former Houston Oilers quarterback Oliver Luck. During his childhood, Andrew found himself travelling to various countries and as a result attended schools in Germany, the Frankfurt International School and London, The American School before heading back to the United States, where he attended Stratford High School and played as the school’s quarterback with phenomenal statistics, which helped him get a 4-star rating from Rival.com. He was also co-valedictorian when he graduated from Stratford. Many universities approached him to play college football but it would be Stanford that would win him over after coach Jim Harbaugh visited him. During his first year playing with the Stanford Cardinals, Andrew would become the starting quarterback, the first freshman quarterback to start in Stanford since 1996. He had a high efficiency rating but received a finger injury during the season’s final game, prohibiting him to play in the Sun Bowl. 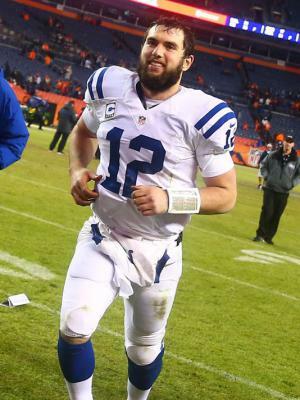 By 2010, Luck would become one of the top players in the league and would become the Pac-10 Offensive Player of the Year. He would break a set of season records for Stanford and by the end of the season was considered a top prospect for the NFL if he wanted to join the 2011 NFL Draft. Luck opted to play in Stanford for his senior year, giving the team a record of 11-2 and becoming a runner-up for the Heisman Trophy two years in a row. According to him, he wanted to finish a degree first before going into professional football. Andrew graduated from Stanford with a degree in architectural design, and also received the Al Masters Award which was given to athletes with great athletic and academic achievements. By 2012, he was still considered as the top prospect for the NFL Draft and was in the eyes of many teams. During the draft he was picked 1st overall by the Indianapolis Colts, signing him to a four year contract worth $22 million, significantly increasing Andrew’s net worth. During his rookie year, Luck would break a lot of records for both the Colts and the NFL. He would earn Pro Bowl honors and also succeeded in bringing the Colts to the playoffs. He would continue this performance in 2013 and 2014, this time leading the Colts to become divisional champions and continue to earn Pro Bowl appearances. By 2015, the Colts had picked up a fifth year option for Luck’s contract though his season was short lived because of injuries. He suffered from a lacerated kidney and a partially torn abdominal muscle, which led to him missing out on the entire season. Without Luck, the Colts would fail to make the playoffs for the first time since his arrival. In his personal life, Andrew’s relationships are unknown. He mentioned that his favorite musician is Bruce Springsteen, and he is an avid reader of books, recommending numerous books to teammates. He’s also known to congratulate opponents that manage to take him down during a play.